First off, if you missed the bonus comic, go check it out! I like doing game humor a lot, but in some ways, I think I have the most fun with just Kirby being Kirby, and Dedede being Dedede. This is one of those not-specifically-game-related comics that should be done from time to time. BitF’s pretty defensive of Kirby’s blind optimism. Is this a reflection on how I think one should go through life? Not necessarily, but it sure seems to bring him more joy than Dedede, at least for the time being. 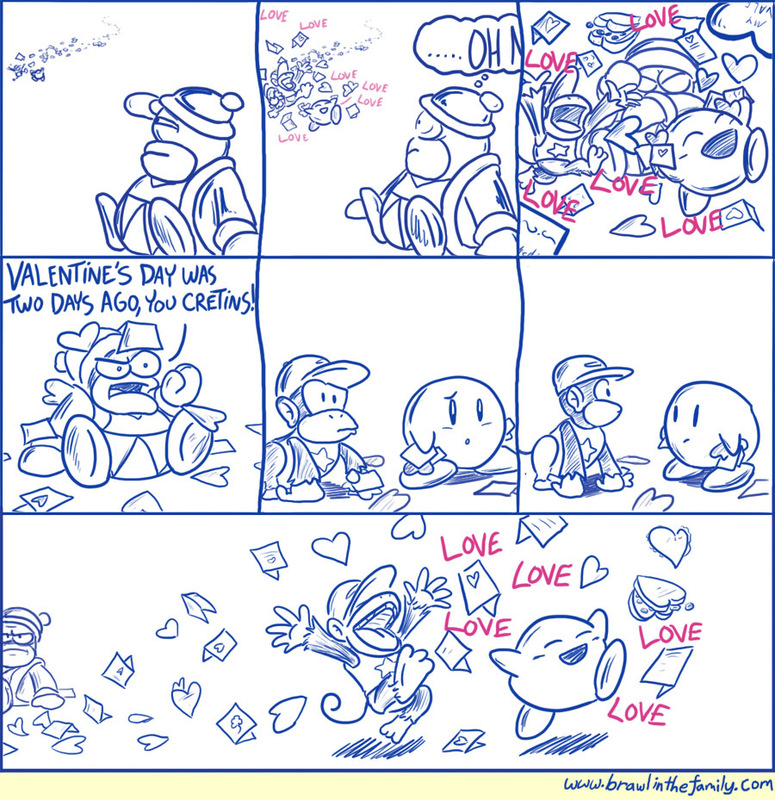 To Kirby, it being or not being Valentine’s Day has no real significance to him partaking in a joyous jubilee. Okay, now I’m getting dangerously close to “explaining-the-joke” territory so I’ll digress a bit. I sort of wonder what type of reception these comics get. BitF got its fame on Nintendo-related jokes for the most part, but I’ve since become attached to this cast and their quirks, and I’m wondering if other fans feel the same. What do you think? More game humor, or keep it a mix like I’m currently doing? Email us at staff AT brawlinthefamily DOT com or post your thoughts on our forums! Our store will be opening fairly soon! We’re making the plans right now. As for Haiti, I’m still making steps to get done what must be done. I realize this is taking some time, so we’ve decided that if we don’t get a solid answer very soon (by the next update or two), we’ll simply have to refund everyone’s money and ask that you donate to Haiti through a different program. But hopefully it won’t come to that–I’ll be persistent.